Bo Hanna, Tirsa With and a delegate from TranScreen reflect on this years highlights and setbacks in queer activism, the status of allies and adversary’s and discuss whether the very diverse queer community of the Netherlands is represented by the right people in the right places. IQMF hosted this talk for the first time in 2017 and has decided to make this a recurring discussion due to its continuing relevancy. In the magical year of 1983, the summer child of Surinamese descent known as JNM (the Naked MC) claimed her space on Planet Earth. At an early age she already knew that the spotlight is her peace. Dancing, singing and acting in front of the mirror became her daily routine. Up till today this ritual hasn’t changed much, even though her mirror is often more replaced for stages like Mercedes Benz Fashion Week Amsterdam, Uitmarkt, IDFA, Kunstbende, Amsterdam Roots Festival and Milkshake Festival. The list adds up as this all-round artist takes herself places she dwells in. JNM is a pleasure to the ear, eye & soul. Bo Hannah was born in Sweden, has Coptic-Egyptian roots and grew up in the Netherlands. He studied French and Middle-Eastern Studies at the University of Amsterdam. Born out of his own struggles with identity, ethnicity, sexuality and the pressure to conform, he started writing about gender, sexuality and ethnicity in an intersectional way. His main purpose is to offer a new narrative that encourages people to love whomever they want to love. He also wants to offer an alternative for the dominant view we tend to have in Western media, where diversity themes are only promoted as ultimate Western. Jo-Ann With is a femme queer, curator, product design student and co-founder of the art collective for and by womxn of color: ANTI-BODIES. Her experience with dealing with manic depression and anxiety led to her becoming pro radical selfcare and pro the right to sometimes just “exist” in your poc body. She also fights for the emancipation of queers of color and is also demanding a seat at the table for those who identify as femme. Plette studied fine art at the Utrecht School of Arts and a few years of Cultural Anthropology at Utrecht University. Now Plette works at Utrecht University as an IT professional. Along with Ms. Tobi from Berlin Plette creates large steel sculptures, Plette acts as a performer and has a long history as queer-, AIDS- and gender-activist. For years Plette organizes festivals and all kinds of art and queer events. In the distant past Plette (Paul) even toured with a band through the Netherlands and in that time was a radio producer as well. Although Plette has been a gender activist for years and “he” actually is a huge trans-in-the-closet, Plette is one of the founders of TranScreen. Inclusivity and gay rights are often framed as western values or specific to a certain country (homonationalism) and used as an excuse to exclude and dismiss non-western or minority groups on the basis that they are generally homophobic and non-egalitarian. This lecture analyses the rise of homonationalism and pinkwashing in the Netherlands. Refugees and migrant people of colour tend to be exploited and addressed as exotic sexual beings while not being able to create a real connection in their new country of residency. Inspired by curated scenes from Bruce la Bruce, Berlin Drifters and Welcome Refugees, three films that address this topic, our guests share and discuss their personal experiences after moving to The Netherlands. Sudeep Dasgupta is an Associate Professor in Media Studies at the University of Amsterdam. He lectures and has published extensively in the fields of global media, aesthetics, post-colonialism, gender and sexuality. With his critical and experienced view on film, he is also part of the IQMF programming team. Nida Pervaiz is a 33 year old lesbian from Pakistan. She is proud and out and came to the Netherlands in 2016. She was illegal for 2 years and is legally back in the asylum procedure again. She is a volunteer at Cocktail Midden Nederland and is one of the participants in QFMV radio podcast. Fayaaz is 24 years old, with Surinamese background and migrated in 2012 to the Netherlands. He self-identifies as gender fluid. He is involved for 5 years now in the area of human rights, specifically with multicultural LGBTQIA+. 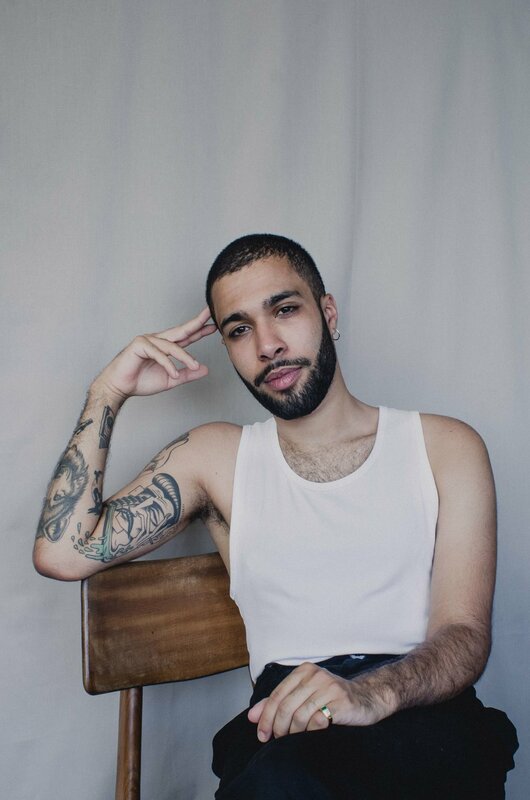 He has led projects of queer refugees, worked at COC The Hague, volunteer work at STI AIDS Netherlands, and is currently a board member of Colored Qollective (safe space for queer people of color in Utrecht). Tamara Shogaolu has spent most of her life living between Panama, the U.S. and the Middle East and currently resides in the Netherlands. As an artist, she is interested in pushing the boundaries of traditional storytelling to tell stories in various mediums, platforms, in virtual and physical spaces that promote cross-cultural understanding and challenge preconceptions. Larry (39) was born and raised in south American in a Caribbean island. He was the personal adviser and chief of staff of prime Minister of his country for over 5 years. After he was outed in public he had to flee his country immediatly in (2015). He currently lives in Groningen and works for a football club. And volunteers at COC and alfa college as a gast docent. The festival’s Queering the Stage program introduces ways of queering the performing arts. How can performing arts crush patriarchy, abolish gender roles, and move beyond the heteronormative axis on an trans-regional level? You are invited to discuss the topics with professionals from diverse cultural fields. Following the debate, three films – ANYA KNEEZ: A Queen In Beirut, Decoding DarkMatter, and Tango Queerido – supply the audience with possible approaches to the topic, focusing on the fields of drag, poetry, theatre and dance. The discussion is moderated by Marcel Heyman. - Merel Moistra is Philosopher, Psychologist, Mother, Father, Songwriter-Singer, Comedienne, Actress, All round entertainer. Star of the Dutch theater-comedy scene, bearer of the rainbow-flag, the mother of change, self-made woman and more. Must we name it all? Oh yeah, she has been there, done it, and it was well received. A long string of successes that would bore you to tears. Must we include that this extremely successful person is also in the possession of a well-rounded and grounded character? An extremely spiritually guided person, who wants to change the world for the better? Or will this overload of information about her self-evident quality only rub you the wrong way and provoke a raging fit of obvious envious jealousy? - Brian van Nunen is a transman born in 1976 in the south of the Netherlands. He has written poetry since 2003, started painting in 2013 while he was waiting for his medical transition from female to male. At first the paintings were on small canvases with cheap paint but after the operation in 2014 when he started to evaluate his life and wanted to become visible, the paintings became bigger and the paint of better quality. Besides working as an artist he also works as office manager at COC Netherlands and is planning on starting Trans United Utrecht in 2018. - Keren Rosenberg is a Middle-eastern, Amsterdam based performer | maker | movement researcher. Through her works and artistic practice, she seeks to articulate a new physical and social political gaze over the body and the environment it functions in; Hunting for rituals and physicality that can liquidate boundaries between the body and the environment we live in, between our social skin and the primitive body underneath. Questioning queer and social political context from a hetero-fluid perspective, while creating multidisciplinary collaborations with artists from the fields of Photography, Film, Design, Sound and Theory. Keren is also a certified Gaga teacher. - Aleksandr Vinogradov is Karelian film director, who was born in the North of Russia. He moved to Moscow in 2002 where he started to work as a graphic designer. In 2012 graduated the Humanitarian Institute of TV with honors and presented his graduation film “Five Steps of Butoh” about contemporary Japanese dance performed by a Russian dancer. In 2012 he was accepted to a documentary filmmaker’s master program DocNomads where he experimented with a form of his documentary films. Recent works of Aleksandr are mixing classical narrative of storytelling with contemporary and animated elements, both of them are helping to express internal conflicts of films. His latest graduation film “Call Me Chaos”, about a chansonnier who fights for her artistic freedom through her music and lyrics, was premiered at Visions Du Reel in 2016. Since 2015 he is working on a feature documentary “QUEER TANGO GOES TO RUSSIA” about the LGBTQ dance movement in St. Petersburg which is scheduled to be released in 2018.
Who is the best representative of the queer & migrant community? As a festival we want to keep a critical gaze inwards as well and we also wonder who has a right to speak at any given time. We will explore this based on the following 2 statements: White LGBTIQ individuals are not equipped to represent queer people of color; Heteros should do more to support the emancipation of the LGBTIQ community. Queer Festivals face problems and are under constant attack in many countries. Recently, a two day LGBT film festival got banned in Ankara because the festival "could incite grudges and enmity toward a part of society”. In Tunis, the brand new Mawjoudin Queer Film Festival will be launched in January 2018 and it might face challenges too. Gizem Bayiksel and Karam Aouini will talk about their drives and motives, their passion and activism in the debate Queer Festivals under attack. In what way can activism change your life? Prior to the films Grey Violet – Odd One Out & HALF A LIFE, we interview four queer activists on their work and the influence it has had on their life. Some of them have to flee their own country and have rebuilt their life in the Netherlands. Do they still have hope for the LGBT community in their own country? And what advice do they have for the Netherlands?